Chihiro Kaneko, as a 35-year-old veteran of 13 seasons, probably possesses a fair amount of wisdom he can impart on the Hokkaido Nippon Ham Fighters pitchers younger than him. Even those who have already moved on. 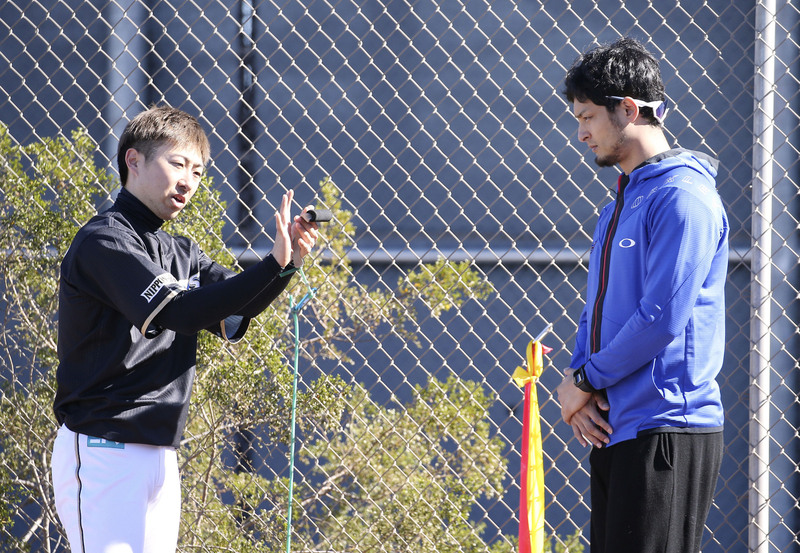 Former Fighters ace and current Chicago Cubs pitcher Yu Darvish checked in on his old team at Nippon Ham’s spring camp site in Scottsdale, Arizona, last week and spent some time talking shop with Kaneko, who was throwing a bullpen. According to Sports Hochi, the two former Pacific League MVPs discussed Kaneko’s change-up. Darvish hasn’t been the only one admiring Kaneko’s off-speed offering. “I read (Kaneko’s) book “Henkyaku Bible (Breaking Ball Bible),” and watched videos of the pitches and I think each type is amazing, but I think the change-up is the best,” teammate Takahiro Fujioka told Nikkan Gendai. It was a somewhat fitting meeting of the minds between Darvish and Kaneko, as both pitchers head into their respective 2019 campaigns looking to rebound after difficult seasons. Darvish only made eight appearances and was 1-3 with a 4.95 ERA before succumbing to injuries in 2018. Darvish had gone on the 60-day disabled list in May with tendinitis in his right tricep. An MRI in August revealed a stress reaction in his pitching elbow and also a triceps strain, leading the Cubs to shut him down. He underwent surgery on Sept. 12. Kaneko’s year also ended in August, when he was taken off the Buffaloes’ active roster with tightness in his neck and back. Kaneko finished 4-7 with a 3.87 ERA on the season. Kaneko hasn’t been the same since 2014, when he was 16-5 with a 1.98 ERA and was the Sawamura Award winner and Pacific League MVP. He got a four-year deal worth an estimated ¥2 billion following that season, but has failed to live up to his past standard. Surgery on his right elbow delayed his start in 2015 and he’s been up and down ever since. Kaneko won 31 games combined in 2013 and 2014, but just 30 over the next four seasons. The Buffaloes reportedly offered Kaneko a 2019 salary of around ¥100 million, a far cry from the estimated ¥600 million he made in 2018. Because players making more than ¥100 million can become free agents rather than take a cut of over 40 percent, Kaneko was free to move to Nippon Ham, where he’ll try to get back on track this season. Hanshin Tigers catcher Fumihito Haraguchi was diagnosed with intestinal cancer last month, the team announced Jan. 24. He later underwent surgery. The 26-year-old recently updated fans about his condition in Twitter post on Feb. 6. The post has garnered thousands of replies from Tigers fans, and baseball fans in general, voicing their support for his recovery. The Chiba Lotte Marines welcomed the Lamigo Monkeys of the Chinese Professional Baseball League to their spring camp for a game on Saturday and they weren’t exactly the most cordial hosts. The Marines crushed the Taiwanese squad 22-0 in a game between teams who are still early in their preparations for 2019. Lotte connected on six home runs in the rout, two coming from big-swinging second-year infielder Hisanori Yasuda. The Marines scored seven runs in the first ining, four in the second, five in the third, two in the sixth and four more in the eighth. Lotte’s Taiwanese left-hander Chen Kuan-yu was one of the six Marines pitchers who kept Lamigo off the board.